I love these visual LCD temperature gauges. They have this nice LCD screen, can be switched between Celsius and Fahrenheit and most importantly have long waterproof temperature probe. And cost just under $5 shipped from China on eBay. Been using one to monitor temperature of water that cools my laser. There’s been only one small issue. Probe wire was not nearly long enough. So I decided to extend it. Depending on type of probe this might work but it might not. 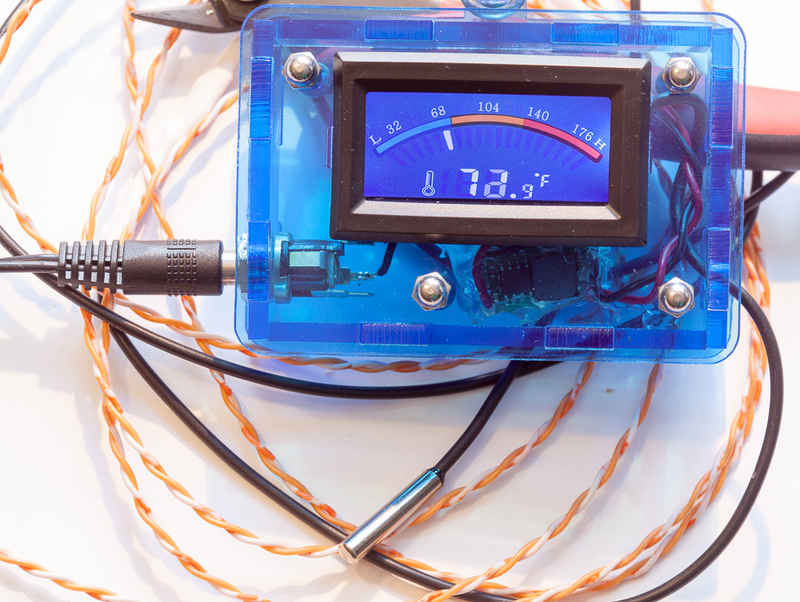 If probe is analog, then adding extra 6 feet of wire could throw off reading significantly due to wire resistance. But if it’s digital it probably won’t matter so much. I’ve been thinking of different ways how to figure out what it is. Asking eBay seller didn’t produce any results. Next I cut cable and found two thin wires (red and black). If wires are color coded this means that probe is most likely not resistive or thermocuple type. It is still possible tho. So it’s probably digital. If it’s I2C type type, it would make sense as 2 wires is enough. Even popular DS1820 sensor which has 3 leads can be powered with “parasite” power from signal on SDA/SCL lines. But DS1820 is much thicker so it must be something else. I even tried turning it on with probe disconnected and it didn’t show anything so it knew probe was absent. Not being able to tell for sure what kind of sensor it by looking at wiring, I decided to open gadget’s enclosure. Inside was this PCB with mystery IC covered by black epoxy blob. Well enough investigating, let’s just try it out. I decided to splice extra 6 feet of wire between probe and device. 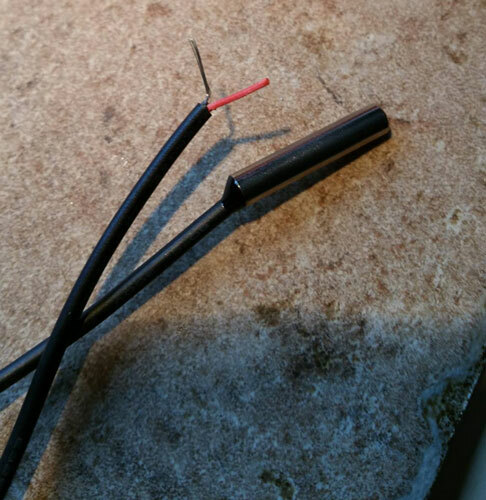 I pulled some wire out of CAT5e network cable spool and twisted it to the probe and piece of piece of cable coming out of temperature sensor’s body, making sure to keep polarity correctly. Checked the sensor and it showed pretty much same temperature as before I cut the cord, maybe 1F degre lower. At this point I just soldered wires and covered joints with some heat shrink tubing. Now it’s over 8 feet long and works great! Oh yeah I also made small acrylic enclosure for it which houses tiny 5V DC-DC buck converter.